One of the important things that at the time after reinstall windows either windows xp, windows 7 or windows 8 if the drivers contained on the motherboard is not automatically detected by the operating system on your pc is the first thing that should be on the driver reinstall is on the motherboard itself, because if the driver is there such a chip on the motherboard, vga driver, sound driver and or ethernet lan driver not yet installed the computer or laptop will not run optimally. For example, if after the computer finished reinstall the sound card and its driver is not automatically detected by the operating system that we installed on the computer then the sound will not come out or no sound that could be heard was the sound card driver means not installed, then if the desktop was ugly little less good image and usually if we will play the game and there is an error message like update your graphics card or error when playing games like that can be caused by vga driver has not been installed or vga which we have in the computer does not meet the specifications of the game the memory capacity vga requiring better. But if we forget the name of the motherboard model or motherboard type we do not know that you are taking this course will be a problem for us, so that we do not know the motherboard drivers, but do not fret just yet because we can use free software to identify the components that we use the computer's motherboard or we can also find out motherboard used motherboard by looking at her directly in the motherboard that usually there is written the name of the motherboard itself so we can immediately find the specifications of the motherboard in google. So just before we download driver motherboard and chipset then it should be known in advance because if one driver may result in our computer so problematic and so ugly performance. 1. 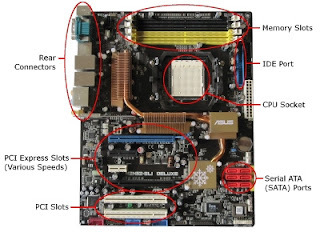 How To Manually, Open casing your PC and cpu we see around the motherboard and look for the words such as jetways or asus or G31lm etc.. As in the picture below is an example of asus motherboard. And this is one more example seen writing or name blah blah deluxe motherboard with a red circle with a name PCI express slot its edge. If the below is embedded in the motherboard chip set is concerned with Intel chip set means the motherboard has an Intel chip set. 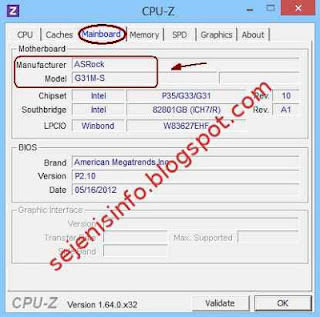 CPU-Z is a software to know the entire model of the motherboard is in the computer. Can be download here. Within the software there is also information about which operating system is used, the sound card info, VGA driver and others. 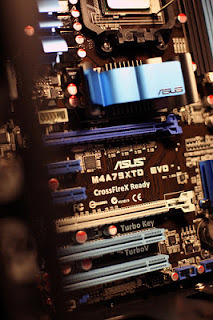 Once we know his name for the motherboard drivers download motherboard such as sound card, VGA card driver, chip set and so it's open http://www.motherboards.org/mobot/manufacturers/ site and find the appropriate motherboard name on the site is very complete INFO and its drivers and bios. 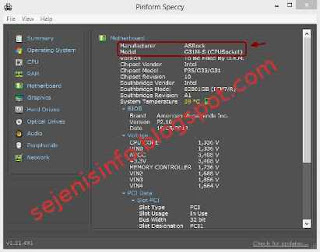 Or we could find on google by entering the name of the motherboard we have seen and plus text specifications or specs, so writing in search google is suppose motherboard name asrock G31ML we just write specifications or abbreviated specs. Quite easy and very simple actually just using tools or software like CPU-z then all the specs on your PC or laptop will look even there I think almost all the specifications of your computer will be visible. 1. GPU Caps Viewer 1.20.1 - WinXP / Vista / Win7, this tool for check your gpu, openGL version and other tool you can use this tool software. 2. GPU-Z, almost same with tool above but this a little different with tool above. 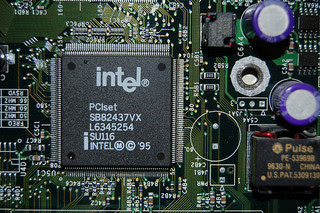 So with some tool or software described above, we do not have to bother to disassemble CPU on a PC to determine the specifications contained in the PC, especially if we are using a laptop, and if it does not know the specifications of the laptop, do we will disassemble our laptop and see the name of the motherboard and chip contained in a laptop? I guess it's not easy and we will give up, but with a tool to check the specifications on the laptop with ease every detail contained in the motherboard will be visible. Good information..Read more Information of Computer Motherboard .